I recently conducted an experiment to see what ammonia fuming results I could get using affordable (a.k.a. “cheap”) ammonia from local hardware stores (Click here to read my article on ammonia fuming with industrial ammonia). 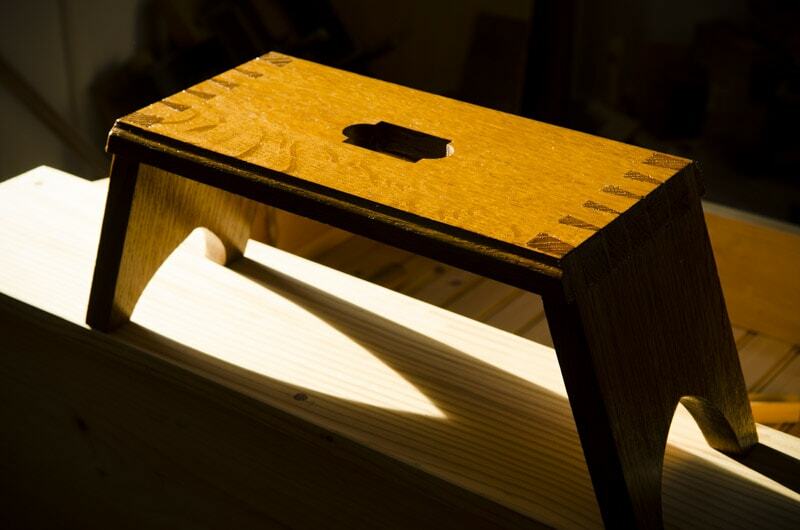 I decided to conduct my experiment on the little Moravian foot stool that I recently built out of figured quartersawn white oak. All other ammonia fuming tutorials I had seen recommended using industrial strength blueprint ammonia. But since very few architects use blueprint technology anymore, I figured it would be pretty hard for most woodworkers to find it. So what is Ammonia Fuming? 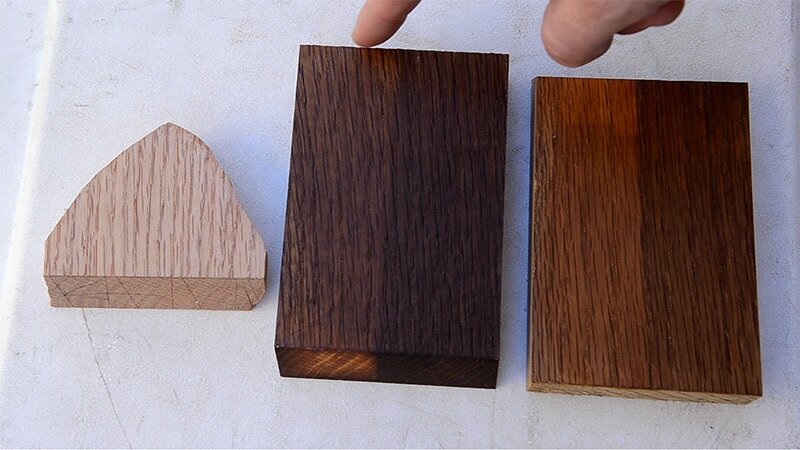 For those who aren’t familiar with what ammonia fuming is, it is a chemical method that furniture makers use to darken and bring out the nice figure in certain woods, typically prior to adding a finish. 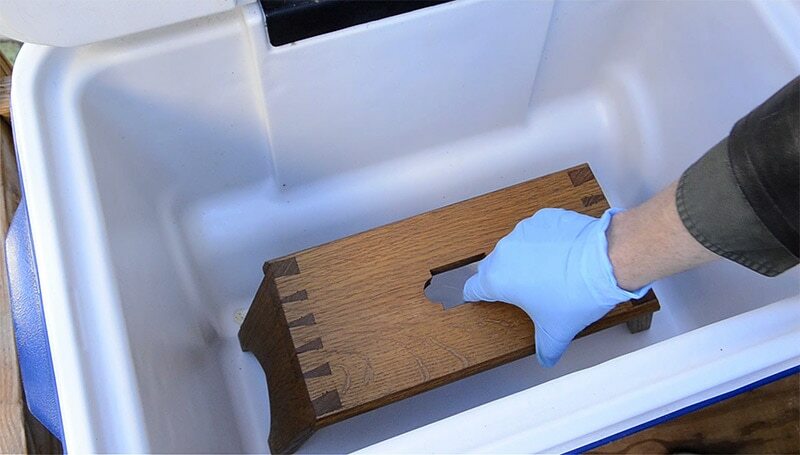 The furniture is placed in a confined space, and Ammonia, or “Ammonium Hydroxide” is left in a little container for a period of time. The ammonia isn’t applied directly to the wood. The ammonia reacts with the tannins in the wood, and darkens the wood. 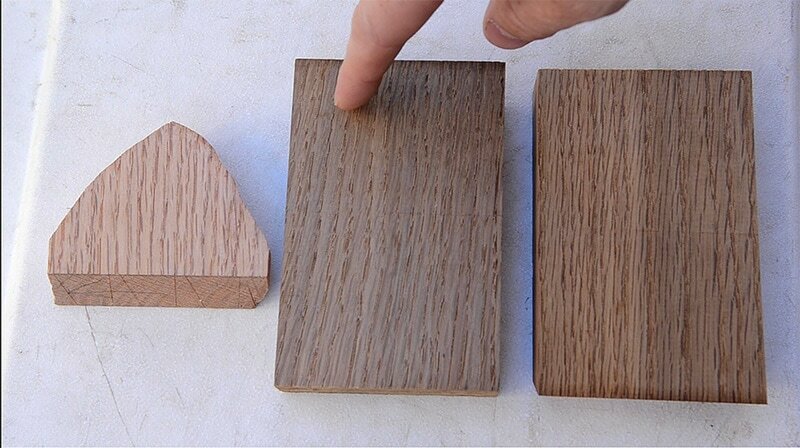 White oak is the wood of choice for ammonia fuming because this wood has a particularly high tannin content. Quartersawn white oak in particular works nice because ammonia fuming brings out the figure and “ray flecks”. 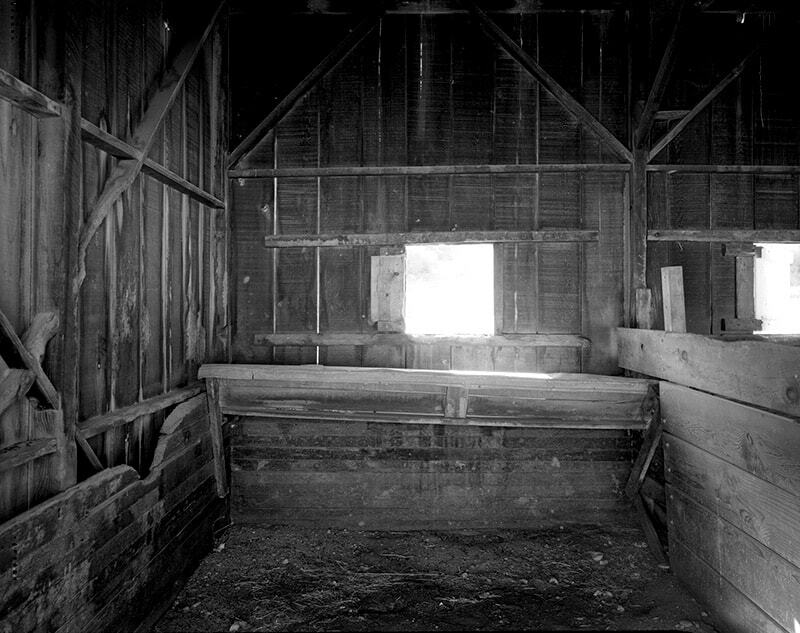 Ammonia fuming was apparently discovered by accident in England when oak boards stored in horse stables were found to darken considerably when being stored near the fumes from horse urine. Eureka! (Or I guess you could say “Uric-A”…sorry if you don’t get my joke). The process became especially popular during the late 1800’s Arts & Crafts movement in Britain and the United States. Furniture buyers loved the effect of the ammonia causing the ray flecks in the quartersawn wood to “pop” with contrast. Even though ammonia is a common and readily-available cleaning product, it can be dangerous and very unpleasant to inhale. Because of this hazard, ammonia fuming was discontinued by most large furniture manufactures and replaced with less dangerous methods that mimicked the results. 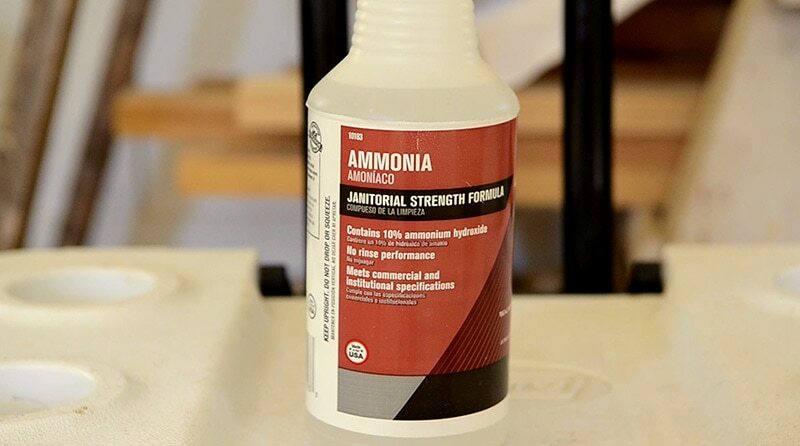 But a lot of modern-day woodworkers have found that they can safely incorporate ammonia fuming if they follow a few safety precautions. So only try this if you accept the risk and use proper safety practices. You must wear rubber gloves and safety glasses or a face shield, and from personal experience I recommend a mask or respirator mask. And don’t try to open your containers while indoors, as the fumes will make any interior room unbearable within just a few seconds (this was also learned from personal experience of “peeking”). I wanted to see what results I could get fuming white oak without Industrial ammonia (25%-30% concentration), because it’s harder to find, but with ammonia purchased from local hardware stores. Because I’m fuming test boards and a small stool, I decided to use two air-tight coolers. For bigger pieces of furniture you can build a simple wooden frame “tent” out of scrap wood and wrap it in clear plastic (clear so you can monitor the progress without having to open your tent. I’ve even heard of people renting a small enclosed U-haul trailer for a couple days. I’m not sure how air-tight trailers are, but this is a cleaning chemical, so it shouldn’t cause any problems with the trailer…maybe it’ll sanitize it! But don’t take my word for it…do some more research before trying that. I purchased an inexpensive bottle of “janitorial strength” ammonia from Ace Hardware, which says that it has 10% ammonia. I put this ammonia in a little plastic container in the blue cooler. I also purchased a bottle of Ammonia from the cleaning aisle at Lowes. Strangely, the label didn’t specify the ammonia concentration. I suspected they didn’t list the concentration because they were using such a low amount of ammonia. This was later confirmed by my experiment. I put this Lowes brand in the red cooler. I used two pieces of quartersawn white oak that came from the same board as the Moravian foot stool that I planned to fume. I put painter’s tape around each piece of oak so I could see the difference before and after the fuming. The painter’s tape didn’t fully block the fuming, as I would later learn. I also kept out a bare, unfinished piece of wood as my “control” sample, in case the tape didn’t prevent the ammonia penetration. Out of curiosity I also experimented with adding my traditional wipe on wax finish (bee’s wax, boiled linseed oil, & turpentine) to the back side of each board and let it penetrate the wood for a couple days, next to a sunny south-facing window, prior to ammonia fuming. If I get enough comments below this blog post requesting a tutorial on making my finish, then I’ll do a video in the near future. I moved the coolers outside because the fumes are too strong in an enclosed space, especially when opening to check the progress. 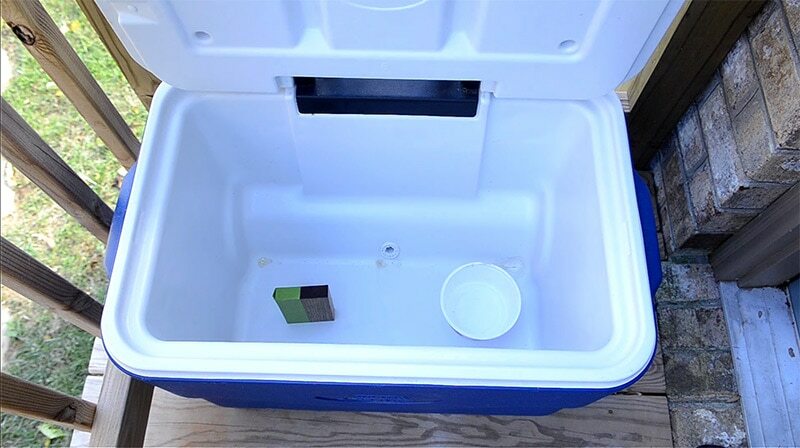 I placed a plastic bowl in the bottom of each cooler, and quickly poured maybe 1/2 to 1 cup of Ammonia into each bowl. I stood the sample boards on end so the ammonia could evenly fume each side, and then I closed the lid tightly. I was careful not to bump the coolers so the sample wouldn’t tip over. It’s a good idea to place the cooler under a covered area in case of rain. But if you can’t, I’m sure rain can’t get into the cooler. 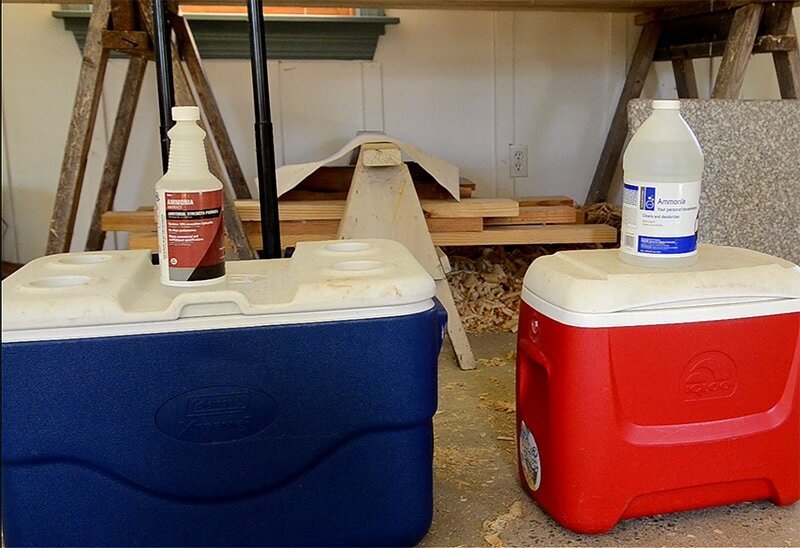 You can also store the coolers in your workshop, as long as you don’t open them indoors…not even for a couple seconds. If you don’t believe me, give it a try and you’ll be running outdoors for a breath of fresh air. I checked the sample boards each day for three days. My experiment was a success and proved that you can indeed use inexpensive cleaning ammonia from the hardware store to do ammonia fuming. And I discovered that 2-3 days will give the best results with a 10% or less Ammonia concentration. Just make sure you experiment with sample boards beforehand. The Janitorial strength (10%) Ammonia from Ace Hardware was noticeably darker than the ammonia from Lowes, but the Lowes ammonia seemed to work fairly well too, especially if you don’t want a super dark finish. It all comes down to your preference. It turned out that the painter’s tape did not totally prevent ammonia fuming, so it’s a good thing that I kept a bare piece of wood aside for comparison. You’ll notice that the wood has a dull greyish brown look, but a top coat (like shellac or beeswax finish) will change that. I was astonished to see how stunning the results turned out on the sides of the boards that got the bees wax and sunlight finish prior to fuming. The Janitorial strength Ace Hardware Ammonia turned it a dark coffee brown, almost like Walnut. The Lowes ammonia turned it a nice dark golden amber hue. I liked both results and will likely use both brands of ammonia in the future. For my Moravian foot stool I decided to go with the janitorial strength ammonia. I rubbed in my beeswax finish onto the stool and let it darken in the window light for a while. I would recommend at least a couple days, rotating it every once-in-awhile. I got side tracked and let it sit for a few weeks, but turned the stool around every day or two. If you’d like to be notified when the next articles & videos are released, click right here! Yes, I’ve read that book and laughed when I read about George’s ammonia idea! No, I haven’t heated ammonia because I’m doing one piece of furniture rather than a whole room at a time. Yup, I agree. Not a good idea to heat up ammonia in an enclosed space. When I fume QSWO using the Ace 10% Ammonia, I use a reddish brown water based Transtint dye first. I found the fuming leaves a slight greenish tint on the wood and pre-treating with the reddish dye counteracts this. (Red and Green make brown.) I then use a wiping Varnish as my final finish after fuming. Just the way I’ve found works best for me when making Arts and Crafts style furniture. Thanks for the tip Ken! There are so many fascinating finishing methods out there that I don’t think I’ll ever learn them all. The stool looks great. Working on a piece of quarter sawn white oak right now. Will have to give that a try. I would be interested in the bees wax recipe. Thanks for the info on the household strength. Out of curiosity, I just wonder what would be the result if you wiped some on the wood in the way you would add some water to raise the grain of wood and then smooth again. Would it be possible for you to cut some of your oak blanks at an angle so we can see how deep it penetrates? You’re welcome Joe! 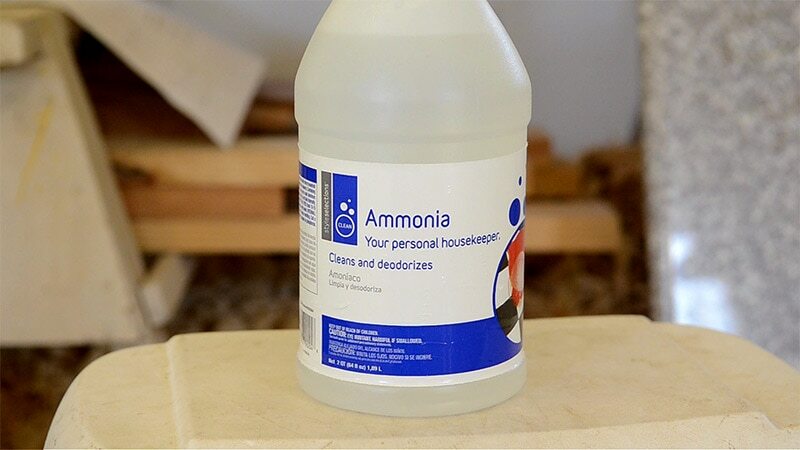 I’ve never tried it, but I don’t think wiping ammonia on wood would cause the darkening, as ammonia is often used to clean wood surfaces. I believe it is only the gases that come from ammonia that will fume and darken the wood. But you’re welcome to experiment and let me know what you discover! The ammonia concentration in the fumes is nearly 100%. The ammonia concentration in the liquids is only 5-10%, so wiping the wood with it would not be very effective. The higher the initial ammonia concentration in the water, the denser the fumes and the faster the results. Yup, which is why the fumes are so much more potent after it has been fuming for a day than when you’re simply just cleaning with it. Thanks for your comment! Thanks for letting me know Jim! Yes, please do a video on your beeswax/oil finish. Thanks Michael, I’ll try to do it soon. Would like to see video on beeswax formula. Thanks for posting, stool looks really nice. Please do a video on making the beeswax and oil finish!! 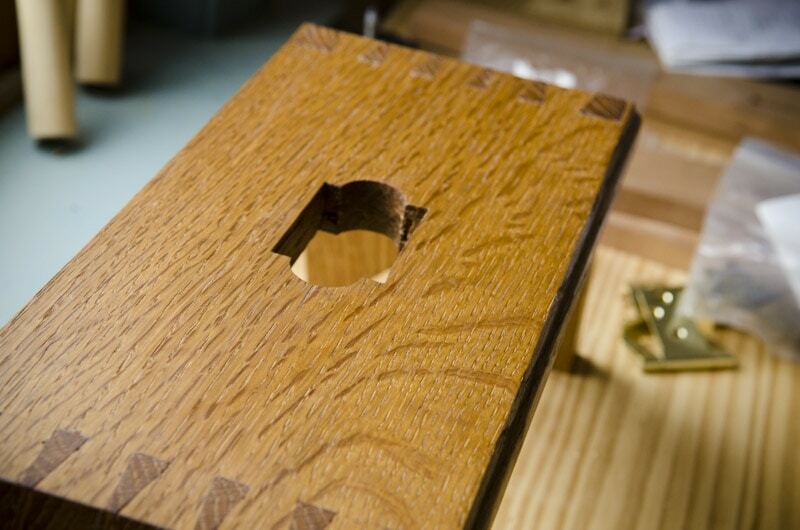 Your bees wax, boiled linseed oil and turpentine finish really looks great on the fumed oak. Would you please do an article/video about how you make it? 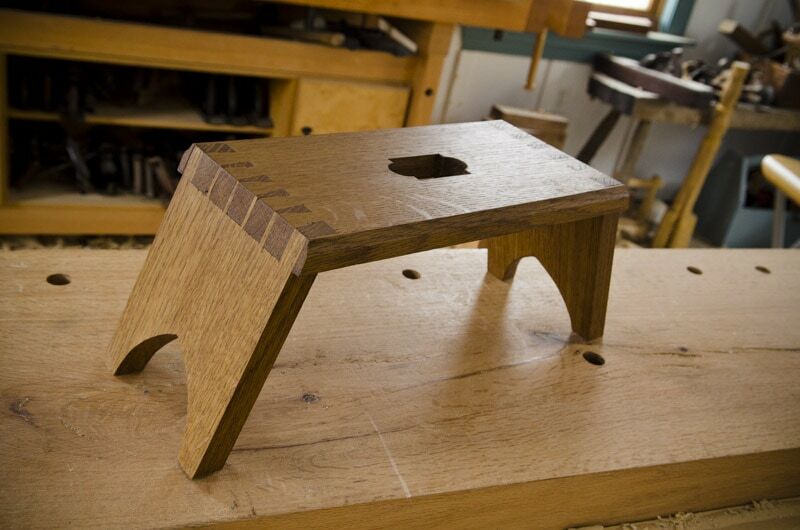 The little stool really turned out well. Thanks for posting the video and additional info. Thanks Dan! I’ll do that video soon. Did you do a video on the formula for the finish? Sorry, I’m having a hard time finding it. Thanks for the help. What a nice result. Interesting that it get’s so much darker with beeswax. 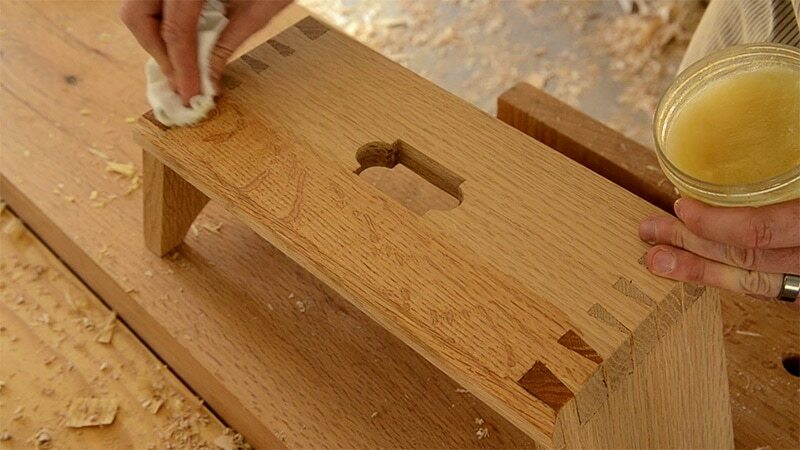 I have wondered how some oak tables got so dark without staining it, so here’s how. Thank you for doing the experiment and sharing it. You’re welcome Bo! Yup, it’s a pretty cool process. The comparisons of the control piece and the two types of ammonia are really helpful in guiding my use. Sorry that you had to learn the hard way about how quickly the fumes could fill your shop. Another good piece of information for those of us who are learning through reading about your experience. Thanks again and congrats on the beautiful stool. Ha, ha, yeah, I figured a 3 second peek wouldn’t hurt, but I was wrong! Awesome work! Beautiful finishing. Please share your beeswax/turpentine/linseed oil treatment formula. Thanks, and will do Ronald! Hey Tom, I can stand on the stool and I’m about 220 lbs. The design can also use some brace blocks if the builder so desires. Regarding air filtration, I’m not a doctor, so I don’t know what the long term results would be without air filtration, but I don’t use one. I use a dust extractor for my power tools, but that’s it. But I’d go with what you’re most comfortable with. Very informative, thanks for share. Love trying new techniques, and wouldn’t you know I have bunch white oak. Science experiment here we come! Get that white oak fumed David! I’ll have to look for that impervious barrier tape…where can you buy it? Very interesting and thought provoking. I would like to understand the formula for the finish. Does one flavor of gelato container work better than another? It does look like a mango flavored sorbet though, so I’ll have to be careful on those hot days in the workshop! Very nice. The stool is heirloom quality. I would be interested in the bee’s wax/oil finish recipe. Thanks Paul, you got it! I love the read, however i do have a question in regards to the stronger ammonia solution. project a day or two earlier to achieve a lighter hue. 2) could i do this in a colder climate, like Ohio winter? Very nice project. I can’t wait to try it out. By all means please do tell us more about your finish. If you had to re-sand a piece, do you think you would sand through the color achieved? Somewhat, but the ammonia fuming penetrates down a ways into the wood. 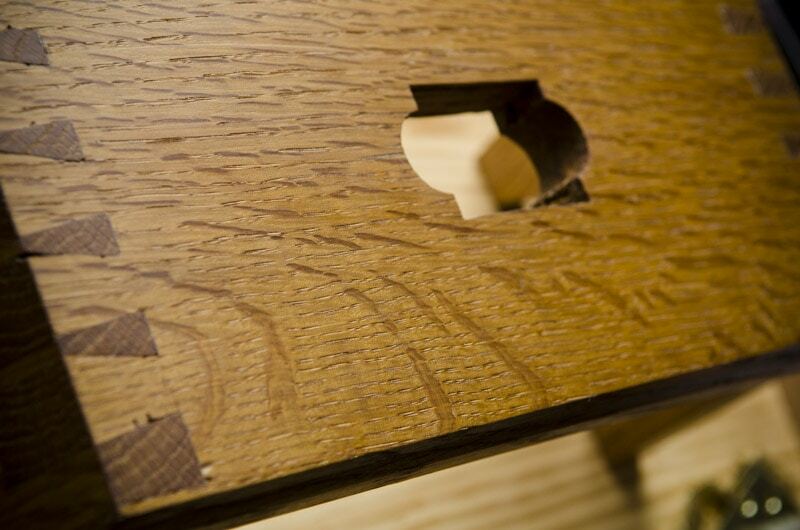 It’s best to get your furniture piece to the final smoothness before fuming. Thanks for your comment Warren! That’s a neat experience hearing about your red oak table and making a profit! Take care, and feel free to comment any time! Thank you for sharing this. My next project is a veterans flag display case, and i will definitely use this method of finish. Just wish i knew more about the beeswax recipe. The beeswax, turpentine and linseed oil recipe would make a great video. The finish looked amazing too. I have an English oak bookcase that would look great with that finish on. I hope you have the interest and keep up the good work! Glad you liked it! And glad to have another English friend join us! 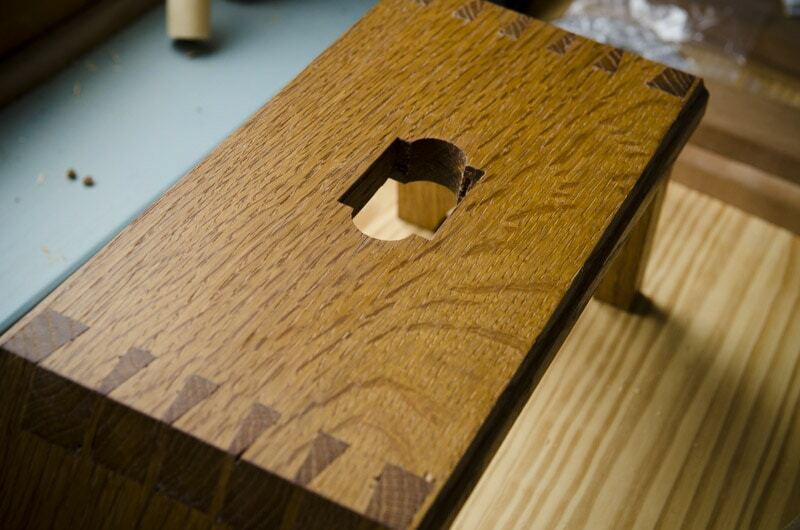 The joinery of the stool looks super, as does the final finish. I’ve been fuming wood, mostly oak, for over 40 yrs with great results. I’ve never even thought of your wax/oil/turp put on before fuming, your idea works great and speeds up the darkening. I’ve tried making a couple of “recipes”, but have not gotten results as good as yours. I would really be interested in your wax/oil/turp recipe. George, I’m glad I was able to offer my idea! I’ll definitely do a video on the finish. I like that you can modify the amount of darkening with the beeswax effect. It seems that consistency from one piece to another might be difficult. Have you tried to duplicate the results by logging and following precise times and measurements of fresh ammonia samples? As in regards to give aways. If not the clamps, i would like Howarths saw DVD, a 3XLT T-shirt, or the coffee cup. I know what you mean about the fumes. I used to work as a janitor. When we had to strip the wax floors we walked around in great clouds of the stuff. Glade to see a demonstration of a different use. Just like everyone else, I hope you share your finish recipe. I’ll check in for the clamp contest. I’d gladly take the bow saw video or dove tail saw shirt. Don’t suppose you’ve got a Stanley 46 mug? I like the look of white oak. I really like the way it looks after fuming. I’m going to give it a try. I’d like to see the beeswax recipe. Shaker candle stand video, any tee shirt, Florida. Glad you’ve been following! I’ll try to do a video on angled dovetails soon. Hi, and thanks for the informative article/video. I am wondering how the time and effect change, relative to the size of the piece being fumed. Any thoughts and or experience? Hello Rick, I’m afraid I’m not clear on your question. Could you please rephrase?